We all know of Maslow’s Hierarchy of Needs: The five stage model divided into basic (or deficiency) needs (e.g. physiological, safety, love, and esteem) and growth needs (self-actualization). I am not pompous enough to call myself a psychologist, even though one of my bachelor degrees was in the field of psychology. Instead, I am going to make a mere suggestion to be added to this famous list: The majority’s need for heroes and great saviors. I can list hundreds of historical examples depicting the hero-seeking aspect of the human psyche: From mythical heroes to folk heroes and today’s action heroes. But I won’t. Instead I want to specifically focus on the peculiar hero and savior seeking tendencies within the realm of political activism. It is extremely important, because it involves not only the general public, but also the establishment that utilizes and exploits this tendency. Remember how our savior-seeking crowd cheered and chanted for Al Gore in 2006. Do you remember his very famous detailed and impassioned speech sponsored by liberal and conservative groups? Gore said that although much remained unknown about the spying program, “what we do know … virtually compels the conclusion that the president of the United States has been breaking the law, repeatedly and insistently.” Oh, but he said even more: “…Article II of the impeachment charges against President Nixon was warrantless wiretapping, which the president said was ‘necessary’ for national security.” It can be an impeachable offense, Gore added. Oh, how we cheered and clapped. Some even declared him the hero and the great savior who had finally arrived. Do you remember? So where is he now? Where has he been since the new Democratic Party King was elected and expanded the previous king’s illegalities and criminalities? Where is that great savior? What has he been saying and doing in the face of our new king’s quadrupled unconstitutionalities? Please raise your hand if you have seen or heard him since we electedhis king versus their king. No, he is not dead. No, he is not in a jail or exile. He decided to live happily and comfortably after. And he is several hundred million dollars richer than when he was delivering those heroic speeches. Then there was the great savior of the media: Mr. Keith Olberman. Do you remember him? The man who we cheered and clapped for as the heroic journalist and commentator who dared to challenge the Republican establishment, and did so on one of the establishment’s own media channels! Oh, how the new hero brought back the nostalgic days of Murrow’s Good Night & Good Luck. Oh, how some declared him to be the heroic martyr who took on the big powerful king. “Countdown” had a niche — a profitable one for both the network and its host, who was rumored to have negotiated a $30 million four-year contract in 2008 — and Olbermann apparently saw little need for change. Meanwhile, his professed commitment to the questioning of authority all-too-evidently did not extend to himself. There were myriad stories about diva-like histrionics in front of — and allegedly directed against — staff. There were instances where his sneering at co-anchors had embarrassing public results.But, more importantly, there was a years-long procession of pundits whose only apparent purpose was to confirm the correctness and brilliance of the host’s every utterance. The spectacle was one in which purportedly respectable journalists seemed to fall over themselves to play courtier to King Smug. As with Gore, this media folk hero is gone as well. Gone, not as in dead. Gone, not as in exile. Gone, not as in jail. He is gone as a multi-millionaire who is living happily ever after with the dollars earned for his services, thanks to you and me, and the rest of the suckers who quickly cheer and clap for phony heroes. But wait. We need heroes. I don’t care how phony or despicable. Just give us someone we can call hero, and let us cheer and clap and worship. Okay? And they gave us another one. Equally phony. Equally establishment-made: The Great Savior Obama. The God of our Nation’s Needed Change. So convincing; for many. So real and heroic to the gullible majority. They needed a hero. Well, they got one. Check out his performance, and tell me how many poor suckers would have enough brains not to fall for a performance this brilliant. So what happened to the great savior of the populace? What happened to the change they could believe in? Who really was this establishment-made and establishment-promoted hero? One of my favorite movies of all time is Leap of Faith starring Steve Martin. I know the majority would watch and laugh. They’d laugh at the gullibility of some. They’d shake their head at the thought of some people being so gullible in real life. Yet, they are one of the people depicted in this movie. They are among those in the crowd who cheer and clap, and say Hallelujah for phony heroes and saviors sent to them and managed by the establishment from above, just as in this scene. The scene in the above clip is a snap-shot of what we see, over and over and over, with a majority who searches for and seeks heroes. The real majority also believe with a blind and unshakable faith. Because they want to believe. Because they want saviors. Because they want heroes. No matter how many facts you give them, no matter how many contradictions you show them, no matter how much historical context you provide them with, they are going to hold on to their beliefs. It is hard to let go of phony heroes. It is easier to hold on to phony notions and made-up heroes. It feels good to be suckers. Even if short-lived. 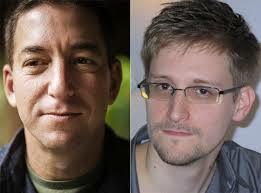 I will continue to write my commentary and investigative series on our new phony hero Glenn Greenwald. The displeasure of the majority will never stop me. It never did, and it never will. However, as I face them, I will continue to ask God: Why do you make so many suckers? The above article by FBI whistle blower Sibel Edmonds is an edited Global Research version.